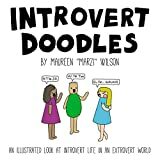 about this book: Co-creator Jenn Granneman and I are both introverts, and she has built up a fantastic introvert community online. Last year at a Christmas party we were talking about some of the beautiful new coloring books that are available, and we realized there aren't any made just for introverts. We decided to change that. Introvert Dreams features 90 pages of artwork and a storyline based on our own dreams as introverts. The story follows a woman and her cat as they wander through the vast, quiet landscapes of her inner dream world. Along the way they will find forgotten places, search for a wish-granting star, and ultimately find themselves in a loud, crowded city—somewhere she knows she won't fit in. As introverts ourselves, Jenn and I find that we often feel alone or misunderstood. We wanted to make this book because we want introverts to see themselves in the story. Many of the scenes are taken straight from our life experiences, like being in the middle of a raging party that everyone else things is fun, but only wanting to cover our ears. Other scenes just represent that beautiful, imaginary, quiet place that I think all introverts retreat to when they have time to close their eyes and dream. This is our first coloring book, although we are both experienced authors. We brought on a talented illustrator, Maxeem Konrardy (also an introvert), who has created a whimsical, breathtaking world. We also paid attention to what colorers told us they want in a book: the images stop just short of the edge of the page, so you're not trying to color into the binding, and none of the big scenes are printed back-to-back, so you don't lose one when your pens bleed through from the other. We want it to be a book you really cherish and enjoy revisiting for years. 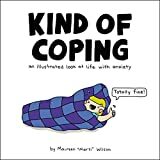 If you're an introvert, or just someone who loves occasional alone time, this book's for you. We hope you enjoy coloring it as much as we enjoyed making it.